License regulations can either be changed through two paths: Governor’s direct order, and through a change in the law. Assembly Bill 4050, first introduced in 2016, would make a standard license available, regardless of immigration status. The bill gained momentum during the 2017-2018 legislative session, with 34 Assembly Members signed on, including Pamela Hunter, Harry Bronson, Crystal Peoples-Stokes, and it was introduced in Senate as S? at the end of session. Nine Senators have signed on so far. “Farms are really important in Western New York and form an integral part of New York’s identity and economy, and today, Rochester, Buffalo and Syracuse stand together to say: we need New York’s elected officials to deliver on issues that are important to us” says …. The health of our upstate farms and cities are inseparable, and safe driving for workers, by having access to a license, would drive the health of our region. Driving is not a privilege, it is a necessity to daily life, and both migrant farm workers who keep farms going as well as asylum seekers who bring new life to our cities need access to a license now. Join us on Tuesday, Aug 21st at 3PM for a press conference on the eve of State Fair to call for driver’s license access for NYS agricultural workers. The New York State Fair, an event that is a celebration of the upstate agricultural economy, kicks off this week in Syracuse. The statewide Green Light campaign is bringing together elected officials, workers and community organizations in Rochester, Syracuse and Buffalo the day before the fair to call for driver’s license access for those who keep the farms running. Since 2002, those without Social Security numbers are denied access to licenses. The Green Light NY: Driving Together campaign seeks to ensure equal access to driver’s licenses for all residents of New York State, regardless of immigration status. Our statewide coalition brings together immigrant communities, advocates, allies and other stakeholders to coordinate a unified driver’s license campaign. Twelve other states across the country have chosen safer roads and increased revenue by giving undocumented immigrants access to driver’s licenses. If New York does the same, it will increase revenue from licensing and other fees by $57 million annually for city and county governments statewide. On April 18th the Green Light Coalition will be uniting from across the state to celebrate the introduction of the A10273 bill which will provide access to driver’s licenses for ALL New Yorkers regardless of immigration status. We will meet at the Capitol building on the ‘Million Dollar Staircase’ on April 18th for a press conference and will hear from elected officials and directly affected community members from across the state. There will also be visits made to key legislators and we look forward to building with coalition members from across the state. Interested in mobilizing from across the state? – Let us know! 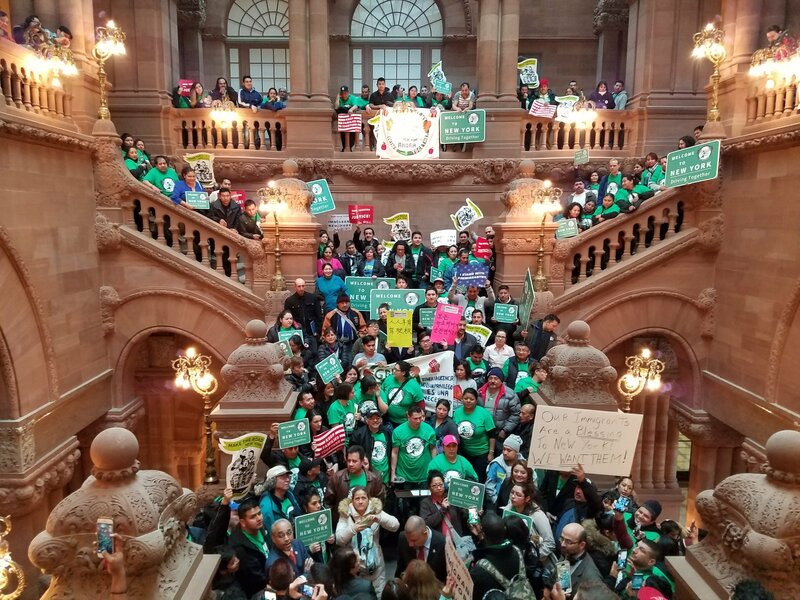 Those living in the capital or who are within driving distance please join us on the Million Dollar Staircase to support the launch of the Green Light NY Bill! El 18 de abril, Green Light Coalition se unirá de todo el estado para celebrar la presentación del proyecto de ley A10273 que proporcionará acceso a licencias de conducir para TODOS los neoyorquinos, independientemente de su estado migratorio. Nos reuniremos en el edificio del Capitolio en la “Escalera del Millón Dólares” el 18 de abril para la conferencia de prensa y escucharemos a funcionarios electos y miembros de la comunidad directamente afectados de todo el estado. También se realizarán visitas a los legisladores clave y esperamos construir con miembros de la coalición de todo el estado. ¿Interesado en movilizarse de todo el estado? – ¡Haznos saber! Aquellos que viven en la capital o que están a poca distancia en automóvil, únanse a nosotros en Million Dollar Staircase para apoyar el lanzamiento de Green Light NY Bill. Call-in Day TODAY: Green Light New York!!! The Green Light NY Driving Together Campaign needs you to show your support for NYS expanding access to driver’s licenses. TODAY Thursday March 15th callAssemblymember Marcos Crespo, the lead sponsor on the bill to thank him for his support for the legislation and ask him how we can accelerate the process of getting a bill number. Below is a sample script with the phone number to call (in English and Spanish); here you can see our SOCIAL MEDIA tool kit with sample tweets and content, videos to post and pictures. Once you have called please fill out this quick form to tell us how it went! We want to make sure he hears from allies, directly affected community members, other elected officials, and community leaders so please spread the word to all your networks. The time to act is now! Central and Western NY were presente yesterday at the Green Light NY: Driving Together campaign’s retreat where we learned together and established our goals for the next year. El Centro y el oeste de NY estuvieron presentes el día de ayer en el retiro de nuestra campaña para ganar licencias de manejar en NY “Luz Verde NY: Manejando Juntos” donde nos preparamos juntos y establecimos metas para el próximo año. Sí se Puede! Posted in Abogados, Central New York, Farmworkers, Grassroots, Greenlight Campaign, Immigration Reform, New York, Organizing, Whats Going on at the Workers' Center?